Khenpo Sönam Tobden (Tib. མཁན་པོ་བསོད་ནམས་སྟོབས་ལྡན་, Wyl. mkhan po bsod nams stobs ldan) (b. ca. 1977) — a young Nyingma khenpo from Namdroling Monastery. Khenpo Sönam Tobden was born in Tibet and entered the monastery at the age of six. Since the time he received teachings and empowerments from Kyabje Penor Rinpoche at the age of 17 in Tibet, Khenpo has felt intense devotion for Penor Rinpoche whom he considers to be his root teacher. In 1998 Khenpo Sönam Tobden entered Penor Rinpoche's Namdroling Monastery, near Mysore in South India. Since then he has studied under the guidance of Kyabje Penor Rinpoche, Khenpo Namdrol and Khenpo Pema Sherab, two of the seniormost khenpos of the Nyingma lineage. 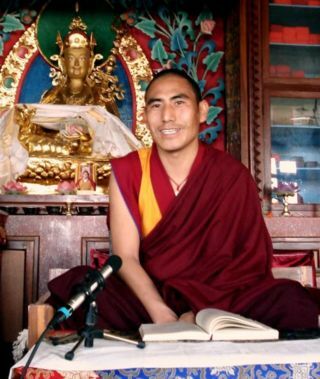 In 2005 he completed the traditional nine years of shedra studies and began to teach texts such as Chandrakirti's Madhyamakavatara based on Mipham Rinpoche's commentary to the younger generation of monks and nuns. From 2006 onwards he has been teaching the students of the Rigpa Shedra in Pharping, Nepal classical shedra texts such as the Bodhicharyavatara, the Madhyamakalankara, the Madhyamakavatara and the Abhisamayalankara. On the 18th March, 2011 he received the khenpo degree at Namdroling Monastery. 2006/2007, in Pharping, Khenpo taught for the first time at the Rigpa shedra, on Shantideva's Bodhicharyavatara. The recordings of those teachings are part of the online Shedra MP3 Library. 2007/2008, Mipham Rinpoche’s commentary The Adornment of the Middle Way on Shantarakshita’s Madhyamakalankara. 2010, teachings on the Madhyamakavatara using Chandrakirti's auto-commentary. 2011, teachings on Mipham Rinpoche's commentary on the Abhisamayalankara. January to March 2012, teachings on the Guhyagarbha Tantra, using Mipham Rinpoche's Essence of Clear Light commentary. This page was last edited on 9 April 2018, at 23:42.